Build personal and real world relationships with contacts. Easily manage contact related matters, tasks, time entries, expenses, invoices, etc from a single place. Get more from matters with cloud based case management software and stay on top of your business. Keep all matter related documents, emails in one place. Create, track tasks even without deadlines. Collaborate with team and plan your agenda better with specific calendar. Get daily updates on activities via email. Automate your law firm to get more time not just for you but for your entire team. Delegate time sheet to staff and track various activities in a timeline fashion. Save time, grow your business with simplified expense reporting and tracking. Never miss any expense record. Raise invoices with just few clicks and get paid faster. 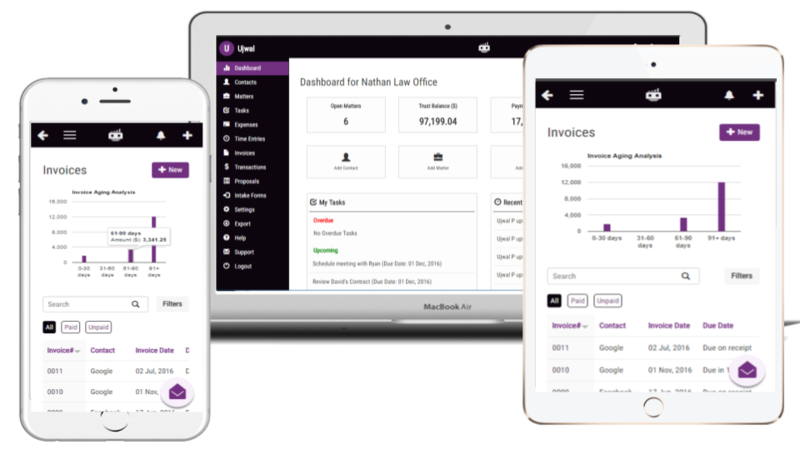 Raise, share invoices and get paid faster with integrated billing software. Track every dollar you owe with money finder feature. Supports trust accounting & all currencies. Create documents on the fly & sync across all devices. All documents managed and stored in secured cloud, share or collaborate with confidence. Collaborate with your whole team and get real time updates and progress. Communicate directly from the system by adding comments. Ensure success for all. Search for any conflicts across your contacts, matters, and custom fields before signing up new clients. Get instant information on all your interests. Engage with your new and existing clients in a much professional, clutter free and paperless way. Create templates & share with clients to define the detailed terms of engagement. See your practice more clearly with realtime analytics about all aspects of your business. Deeper insights to enhance both client happiness and business.